So maybe you've heard: Google's got a new high-end Pixel product that's finally ready for us productivity-hunting primates to purchase. The product is curiously tough to define. It's a tablet, but probably not like any other tablet you've used before. It's a laptop, but only kinda — and with a fair number of asterisks attached. And it doesn't run Android, exactly, though it does run Android apps and have an interface that'll feel awfully familiar if you've used a recent Android phone. 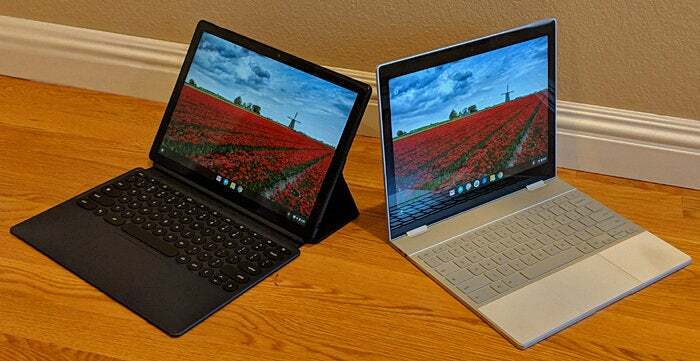 The product, as you no doubt know (you smart cookie, you), is the Pixel Slate — a convertible Chrome OS computing device that doubles as both a laptop and a tablet, provided you pick up its optional keyboard accessory. On paper, it almost seems like a more versatile version of Google's high-end Pixelbook, which is basically the same thing except with a display that swivels back instead of detaching completely. Once you've spent some time using the two products in the real world, though, something becomes painfully clear: These devices are absolutely not equals. And the difference between them is not what you'd initially expect. Let's get one thing out of the way first: Whether or not Chrome OS is right for you is a question only you can answer. I'm not going to waste your time talking about the merits or limitations of Chrome OS as a platform here, because that truly is a completely separate question (and one we've talked about puh-lenty over the years). So from here on out, we're gonna assume you're able to get your work (and non-work) accomplished with a combination of web-centric tools, Android apps, and maybe even a couple Linux apps — and that generally speaking, a Chromebook provides an appropriate and hopefully even ideal productivity environment for you. Capisce? Capisce. All right — so all of that being said, here's the cold, hard, non-sugarcoated truth: Using the Pixel Slate for productivity purposes feels like using a lesser version of the Pixelbook. 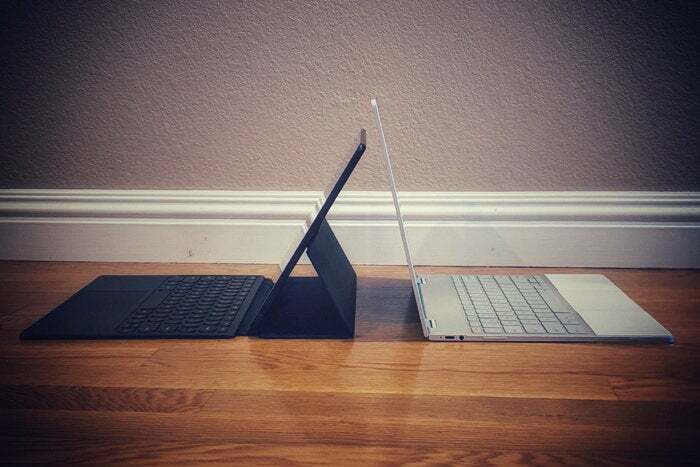 You're trading a premium, luxurious-feeling laptop that also doubles quite effectively as a tablet for a pretty nice tablet that awkwardly functions as a second-class laptop. With the Pixel Slate, instead of a sturdy-feeling metal body à la the Pixelbook, you get a flimsy plastic case with keys built into it. 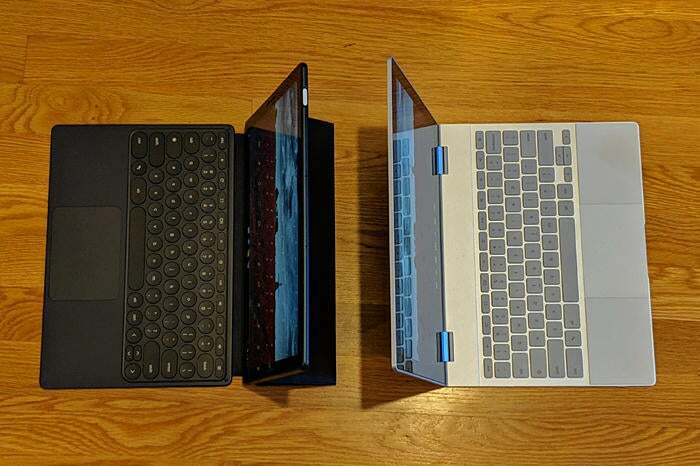 This contrast is most apparent when you try to use the device on your lap — y'know, like a laptop — and its screen wobbles around as you type while its keyboard attachment flexes and shifts beneath your fingers. It's passable enough, but it's certainly not ideal — nor is anywhere near a premium-feeling experience. I'm actually writing this whilst propped up in my bed (yes, it's that kind of week) and moving back and forth between a Pixelbook and Pixel Slate. Each time, the exchange feels like shifting between a top-of-the-line professional machine and a clumsily constructed screen-and-keyboard-attachment combo. The former is an absolute delight to type on, while the latter is one of those things you'd tolerate if no better options were present — maybe while gently kicking yourself for not packing a preferable solution — but would never willingly select, given the choice. Harsh, I know. But we're here to talk truths, and sugarcoating doesn't serve any of us well. Oh, and all of that is only part one. The real sticking point is still ahead. "But surely the Pixel Slate has some advantages," you must be thinking. And guess what, Waldo? You're right-o! The Pixel Slate's speakers are meaningfully better than the Pixelbook's: They're located on either side of the display, which means they're always facing toward you (unlike the Pixelbook's, which are beneath the keyboard and thus facing the wrong way when you're using the device in one of its tablet-like arrangements). They're noticeably fuller-sounding, too — no contest at all there. And despite the fact that speakers flank its screen, the Pixel Slate has smaller bezels than its sibling, which we all know is a Super Big Deal™ in any 2018 technological assessment. The Pixel Slate also adds a fingerprint sensor into the mix, which a welcome touch, but it lacks a headphone jack (something the Pixelbook does have). Win some, lose some, I guess. So maybe the Pixel Slate makes sense for someone who mostly wants a tablet, for more passive types of consumption, and doesn't care so much about the keyboard-using experience? Maybe. But, well, we're talking primarily about productivity here, remember? And even when it comes to tablet-oriented use — because hey, even the most productive among us occasionally needs to kick back and watch a perfectly (ahem) work-appropriate PG-rated video — I'm just not sure the Pixel Slate is really the preferable choice. I get that a lot of folks are accustomed to having a tablet that's a slate-like screen and nothing more, but here's the thing: The Pixel Slate is a really big screen. It's 12.3 inches, diagonally, and just over a pound and a half in weight. That makes it too large and heavy to hold comfortably in the air for long, as one might hold a smaller tablet while lying back and relaxing. So what to make of the Pixel Slate? Who is this product for? Honestly, that's a question I've been struggling to answer since I started using the device about a week ago. I guess if you only want a tablet and don't care at all about having a physical keyboard, you could make an argument for buying one of the lower-end Pixel Slate models — which start at $599 for fairly limited-power configurations. If you really, truly just have to have a tablet that detaches from its base instead of swiveling around, the Pixel Slate might be worth considering. But I'd strongly suggest rethinking why you need that form and whether the swiveling setup might actually address your needs more effectively — especially when you consider the bigger picture of everything else involved. Here's what it boils down to: The Pixelbook is a top-of-the-line convertible that feels like the best of both worlds — a powerful and versatile machine equally well-suited to productivity and entertainment. The Pixel Slate, on the other hand, fails to excel in either domain — and it's downright disadvantageous in the one most relevant to our current focus. If productivity matters at all to you and you're looking for a best-in-class experience, the Pixelbook (which is guaranteed to get OS updates all the way through June of 2024, by the way) is still the one to get. In an era overrun with endless options and ambiguous choices, thank goodness some decisions are still easy to make.